Channel 4 has rebranded its collection of digital channels to unify them in an increasingly fragmented TV landscape. The overhaul includes a complete makeover of E4, the entertainment channel aimed at a younger audience, and a visual refresh for More4, Film4, 4Music and 4Seven. The Channel 4 corporate logo has also changed from a multi-coloured 3D design to the original 2D creation by Lambie-Nairn. 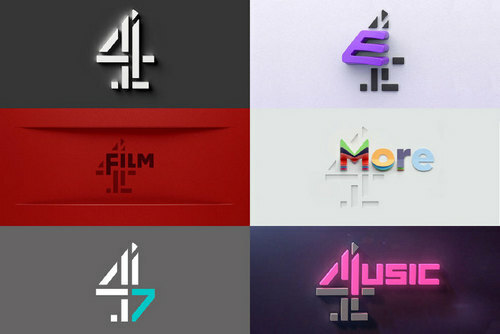 Each new logo, all of which go live today, incorporates the “4” more prominently to emphasise that they are part of the Channel 4 family. Channel 4 saw the need for a rebrand as more viewers move away from traditional TV to streaming services such as Netflix. As a result, the TV landscape has become “incredibly cluttered” and traditional channels are losing their share of voice, according to Matt Berry, group business director at 4Creative, Channel 4’s in-house agency that oversaw the work. The creative challenge of the rebrand was maintaining each channel’s personality while uniting them under one clear network identity, Alice Tonge, head of 4Creative, said. “With more choice out there of channels and more noise, we needed more than just a number four to connect our brand family,” she said. E4 has an updated logo for the first time since 2013, keeping its purple colour but showcasing eight new opticals that represent the youth-focused channel’s playful personality. In the logo, the E is a “mischievous, rebellious character constantly trying to break free from its surroundings and not conform,” Tonge explained. E4 also produced 19 new on-air idents – a figure that’s notably higher than the typical four to six idents on traditional TV channels. The films are made by creatives from across the UK, giving a platform to emerging talent. 4Creative plans to continue releasing new idents over the coming months and years to keep the channel and its ad breaks feeling fresh. Each ident has its own take on the E4 logo, imbuing the channel with a sense of mischief, creativity and fun. For example, “E4igy” is a stop-motion spot, directed by Parabella through Blinkink, in which the “4” goes up in flames. And in “New breed”, directed by Marcus Armitage through Studio AKA, two beasts come together to form a new breed of character, the E4. “Successful idents are a way of not just reminding people of the number you’re watching, but also of reminding people why they’re watching and using them as a chance to entertain,” Tonge said. Channel 4 is not the only TV channel to rebrand this week. BBC Two rebranded for the first time in 20 years, introducing 16 new idents created by British and international animators. In a similar approach to Channel 4, BBC Two produced a higher number of idents than usual and also plans to continue refreshing them.